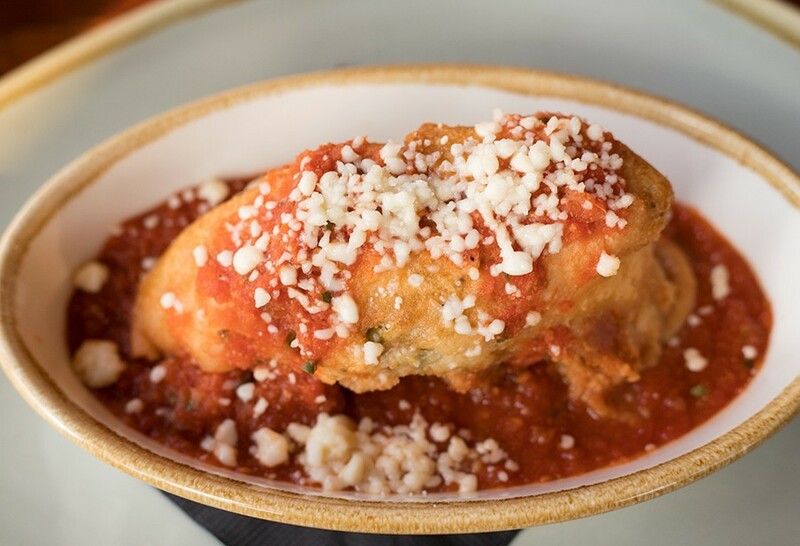 The chile relleno, stuffed with local cheese curd and finished with salsa ranchero and chipotle crema, is a rich, satisfying offering. 740 De Mun Avenue, Clayton; 314-725-0322. Mon.-Sat. 11-1:30 a.m.; Sun. 11 a.m.-midnight. When DeMun Oyster Bar starting serving "backdoor burritos" out of the kitchen entrance during its Saturday morning farmers markets, they were supposed to be a low-key, underground thing. Instead, they ended up becoming the spark that would transform the restaurant. The oyster bar used to set up a small market in its dining room, and the burritos proved an easy breakfast offering for guests browsing it. The kitchen had fun with the concept, creating a playful burrito of the day for those lucky enough to be in the know, similar to the secret menus at places like In-N-Out Burger or Starbucks. Eventually, however, word got out, and the "backdoor burritos" became the market's biggest draw. Owner Alan Richman sensed an opportunity. As he watched the soaring cost of fresh seafood wipe out profit margins at the seven-year-old oyster bar, he found himself at a turning point. He refused to sacrifice the quality that his patrons had come to expect, but he could no longer offer signature items, like oysters, at a price they would pay. The "backdoor burritos" gave him an idea: Instead of continuing to wrestle with rising oyster costs, why not shutter completely and open a Latin-inspired restaurant instead? Richman, who also owns Sasha's Wine Bar just down the street on De Mun, as well as Sasha's on Shaw and Scarlett's Wine Bar, is particularly passionate about Mexican cuisine, a taste he developed during regular travels to the country. Pairing that personal affinity with the kitchen's demonstrated success at executing Latin-inspired fare seemed like a win. It also seemed like the right fit for the area. 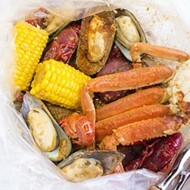 While DeMun Oyster Bar was popular with the date-night set, it wasn't the type of place you'd just wander into while taking a stroll through the charming, tree-lined neighborhood, especially if you had kids in tow. You need only watch the strollers gliding up and down the main thoroughfare or parked at DeMun Park to understand just how family-oriented the neighborhood — smack-dab in the prestigious Clayton School District — has become. If Richman wanted a neighborhood gathering place, he'd have to create a space that made everyone in the neighborhood feel welcome. 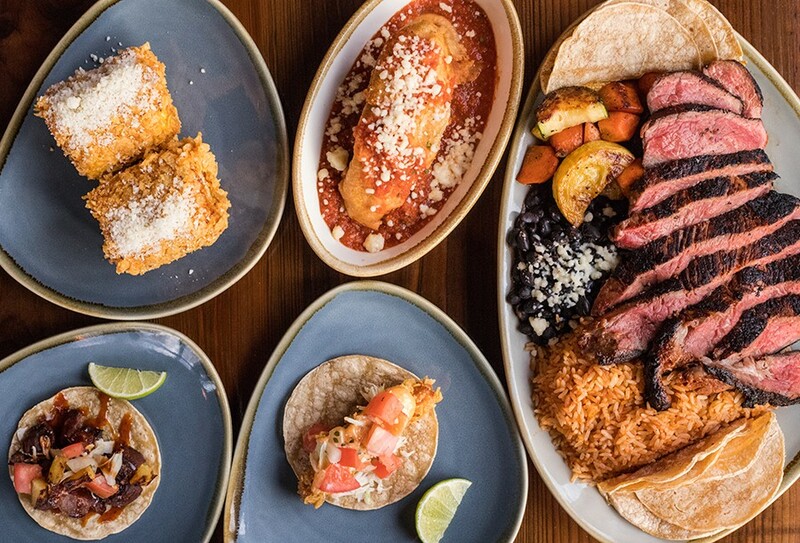 Barrio’s menu features Latin American-inspired cuisine, including street corn, a chile relleno, a ribeye, a fish taco and a pork taco. 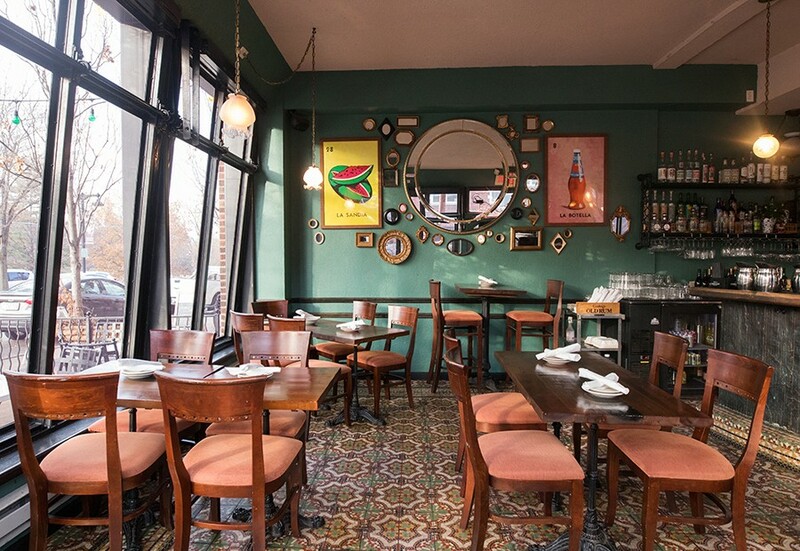 Richman shuttered DeMun Oyster Bar early this past April and reopened as Barrio not two weeks later. The quick turnaround meant nothing more than some cosmetic changes to the space: a fresh coat of teal paint; new wooden tables and chairs; and an indented portion of the wall that now serves as a display case for the restaurant's tequila and mezcal selection. The menu, however, represents a complete overhaul, transforming the restaurant from a stylish seafood-oriented concept into a casual Latin-inflected small-plates spot. Initially, the oyster bar's chef oversaw the transition; now chef Nicholas Jackson is in charge of executing on Richman's vision. 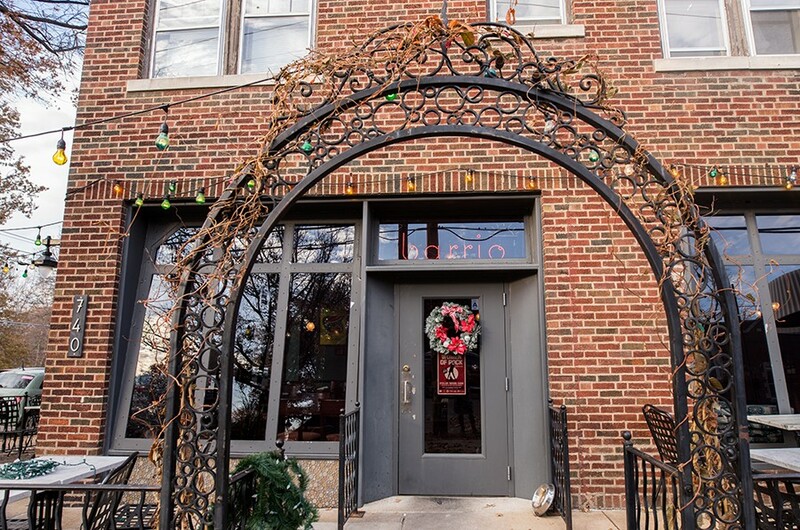 As a place to sip margaritas while overlooking the rolling greenspace of Concordia Seminary after chasing the kiddos around the park, Barrio succeeds. 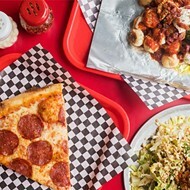 It's the sort of place that the neighborhood, with its close-knit, almost small-town feel, seemed to be begging for. But if the idea for Barrio hits the mark, the food component is still finding its way. There are some high points. Street corn, for instance, is an outstanding take on the form. 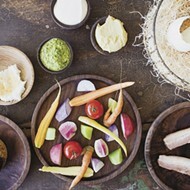 Cilantro and lime aioli coat the pleasantly charred vegetable, which is served on the cob. What makes the offering positively transcendent, however, is the coating, a dusting of crispy corn chips that taste like deep-fried Fritos. It infuses the street corn with a deep nutty flavor and showcases corn's two best flavor profiles: sweet and roasty. It's the best thing on the menu. Barrio’s standout dish is the corn chip-encrusted street corn, a unique play on the Mexican street-food staple. Chicken taquitos are a close second. 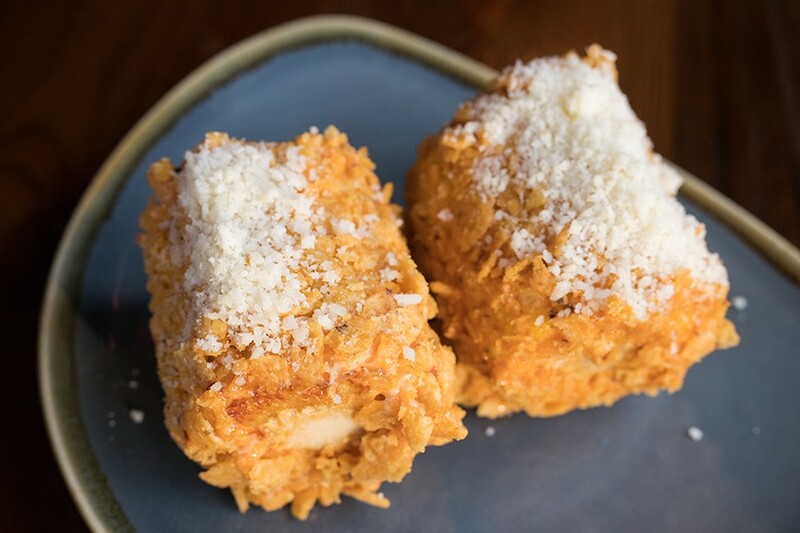 The simple pleasure of marinated chicken and cheese wrapped in a deep-fried corn tortilla is impossible to deny. Barrio's housemade play on the ubiquitous straight-from-the-freezer bar food shows how a little extra care can turn a throwaway item into something beautiful. A chile relleno presents as the expected gooey, spicy mess, with a mild poblano pepper filled with molten cheese curd, charred until its exterior caramelizes and then smothered in a piquant tomato sauce and rich chipotle cream. It's a warm, satisfying dish, something you'd order at the kind of Mexican restaurant where you have to worry about overdoing it on the complimentary chips and salsa. You won't have that problem at Barrio. Here, the chips and salsa are $7 — a hefty price tag for a basket of chips and three small ramekins of salsa with varying degrees of heat. All three versions were thin and unremarkable, save for the fact that the spiciest was so fiery it overwhelmed the palate. You are much better off going with the guacamole-and-salsa combination so as to experience the excellent avocado dip. Bright, kissed with cilantro and lime, and pleasantly rustic in texture, it's well worth the extra $5. Empanadas, which can be filled with chorizo or, in the version I tried, roasted vegetables, have a thick, flaky crust that crisps up around the edges, but retain a soft, pillow-like texture across the rest of the surface area. Inside, the well-seasoned vegetables and black beans remained al dente, giving each bite layers of texture. I was also impressed by the simple cheese quesadilla, a dish my daughter ordered but I devoured after she announced it was too cheesy. I respectfully disagree with her assessment; the wonderfully flaky flour tortilla was griddled to a golden brown and filled with a rich, mild cheese blend that was so generously portioned it oozed out the edges. Salty, cheesy and warm — what more can you ask for? Barrio’s cozy dining room features large windows that overlook the tree-filled Concordia Seminary grounds. Some of Barrio's low points, however, were very low indeed. Just one of the four tacos I tried was successful. That was the chicken version, a small flour tortilla stuffed with juicy meat covered in a mildly seasoned crema. The highlight was the garnish of finely crushed corn chips that gave the taco a nice contrast of texture and imbued it with nutty flavor. It was a far superior item to the pork and carne asada tacos, both of which were dried out and tough. And though the mushrooms featured in the "Hongo" were tender and succulent, they lacked seasoning and came across as bland. The enchilada was the night's biggest disappointment. I opted for the "Supreme" version, which brims with chorizo, chicken, potatoes, corn, black beans and caramelized onions, simmered in a rich red chile sauce. But the tortillas, which should have served as a wrapper for the contents, bobbed loosely alongside them in the serving dish. Instead of softening and absorbing the meat's flavor, they were tough and chewy. It made the enchiladas a mess of textures and difficult to eat. Barrio also serves two large entrees, designed to feed two to four people. One, the half-roasted chicken, had a delicate crispy skin, but lacked seasoning. It was also overcooked, resulting in tough, dried-out meat. 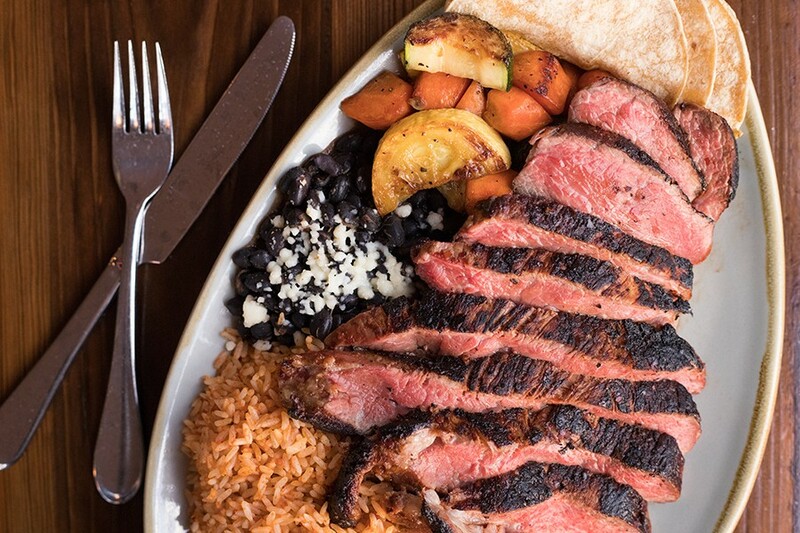 The ribeye, a highlight of Barrio’s menu, has a wonderfully seasoned exterior and is served with rice and beans. The ribeye, however, was a thing of beauty. The massive, bone-in steak was flawlessly cooked and delectably seasoned with an earthy rub. The kitchen boldly slices the meat into strips before serving it; it came out as a flawless medium-rare, showing that whoever was working the grill knows how to properly rest his steaks. This is the sort of expert execution you get at a steakhouse. In fact, our server joked that the ribeye is so good, the restaurant should be renamed "This Steak." He had a point. Chef Jackson has a background in pastry, and it showed in the one dessert being served the night of my visits: the churros. Granted, it's difficult to mess up fried dough coated in sugar and cinnamon, but these were especially delicious. The dough had a hearty crunch impressive when paired with light-as-air texture. The churro melted in my mouth, leaving just a whisper of cinnamon sweetness. The accompanying chocolate glaze was delicate enough that it enhanced the flavor but did not overtake it. It was a crowd-pleasing sendoff. The only thing sweeter than the churros was the service. Though there were some lags here and there, our servers went out of their way to make us feel welcome. It's Barrio's biggest selling point — well, that, the location and the shockingly stiff margaritas. If you have two, you might want to call a ride. Barrio aims to be a convivial gathering place for the DeMun neighborhood. 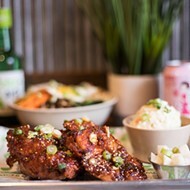 But while the food has its moments, it also shows the trouble with opening a place that features a storied cuisine when you have only a limited background in it. I understand the allure of Mexican food. Not only is it absolutely delicious, but it has become so interwoven into the American culinary fabric that it seems familiar — enough so that we risk assuming that anyone who knows his way around a kitchen can cook it. And maybe he can, but only with some serious research into its history and techniques. Being an enthusiast is only the first step in a long journey. In this regard, Barrio has a way to go. I am hopeful that it finds its way. 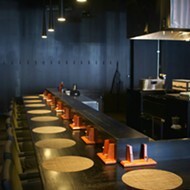 Barrio has a committed staff, a great location and some good dishes. Most importantly, it has the right idea for what the neighborhood needs. That could be the bones of a solid spot. If Barrio can fill those in, it will become the success it intends to be.